A northern view of the Klamath River entering the Pacific Ocean. The river is on the far side , flowing from your left to right. 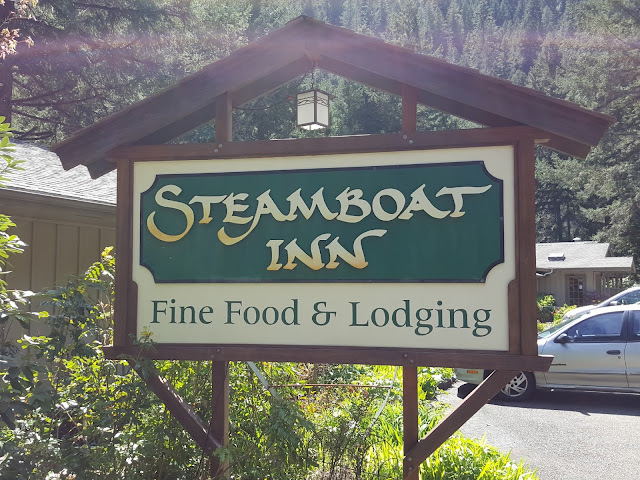 Leaving Kamp Klamath, we had traveled a short way on Route 101 north to Requa and up about 600 plus feet for the first picture above. Following that we continued on Route 101 north to Crescent City. This road was quite hilly and winding. But what was more concerning was the amount of slide damage from the recent storms. There were a number of sections that were one lane only as crews were working to repair roads that had lost most of the underlying support. While waiting for the one lane signals we notice first the mural style painting on the back of the Class C in front. Then we notice the license plate---Maine!!. how about that. Crescent City is a small town on the northern coast of California. When we headed in---to pick up a few groceries--we noticed that it might be a lot busier in the summer season. As it was, there were a number of wind surfers in the 40 degree weather enjoying some strong winds. We parked out by the water to have some fresh toasted bagel and cream cheese and a great view. This was our view, Battery Point Lighthouse. A short distance above Crescent City, we branch off on Route 199 which will eventually bring us to Grants Pass in Oregon. 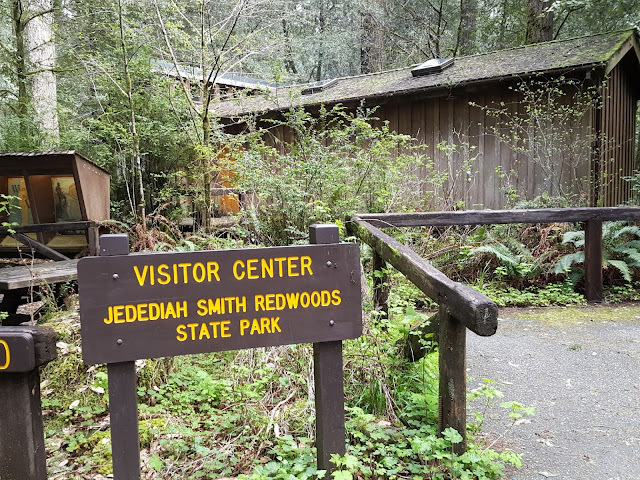 Still in California though, we stop for a few nights in the Jedediah Smith Redwoods State Park. 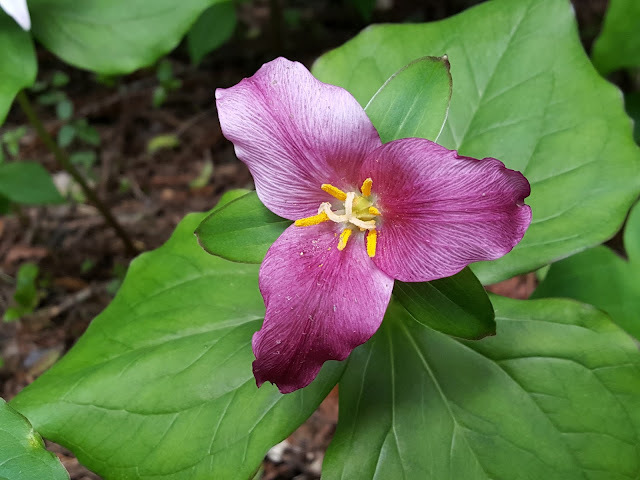 Jan and I are treated to many Trillium , both white and this purple one. 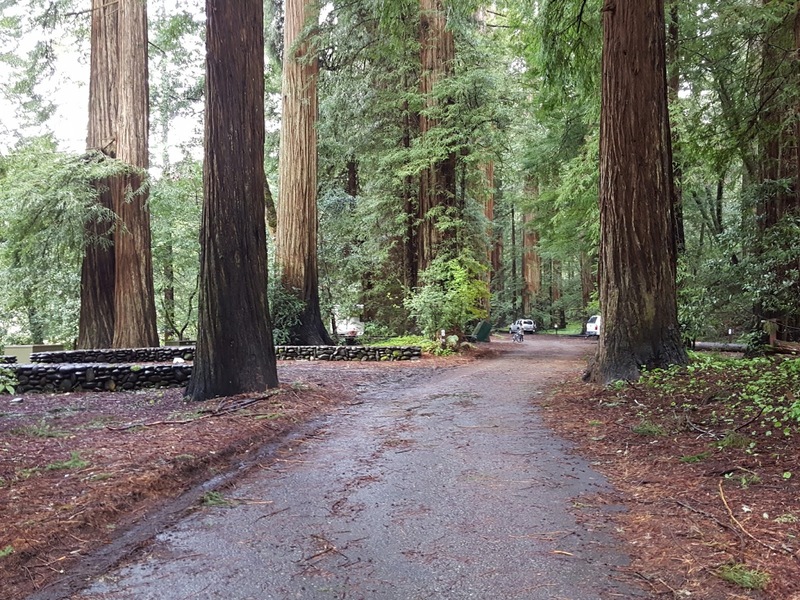 This will be our last section of giant redwood trees. Yes, it is raining again. Some of you know that we will often stay put in a campground and wait for sunshine, if it is raining. But since Central California, we have had many more days of rain and very few days of sun. Right now, we are averaging one day of sun for six days of rain. Besides------it makes the narrow, curvy,steep, drop-off-the-side Route 199 that much more interesting. Since it is raining---no solar charging today--, we decide to stop at Bridgeview RV Resort in Rogue River, Oregon, just past Grants Pass. 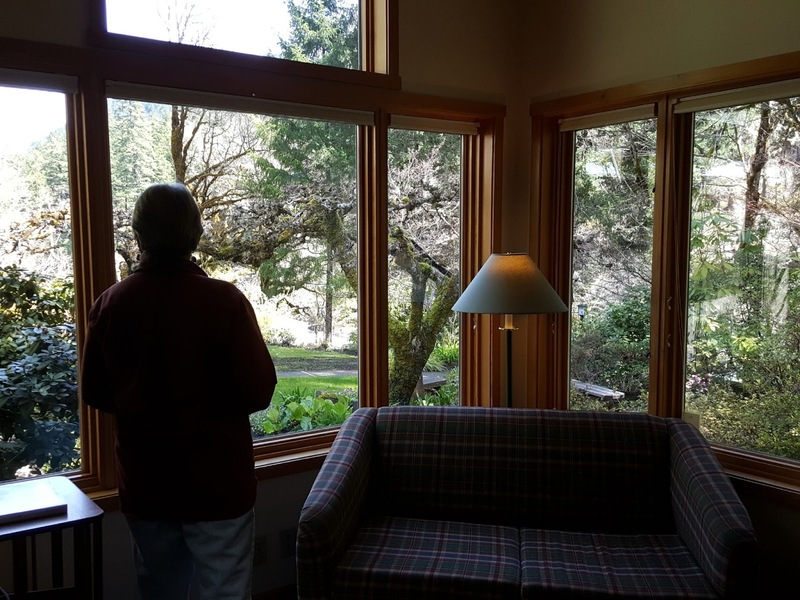 Though the sites are close together, we have a view of the Rogue River. 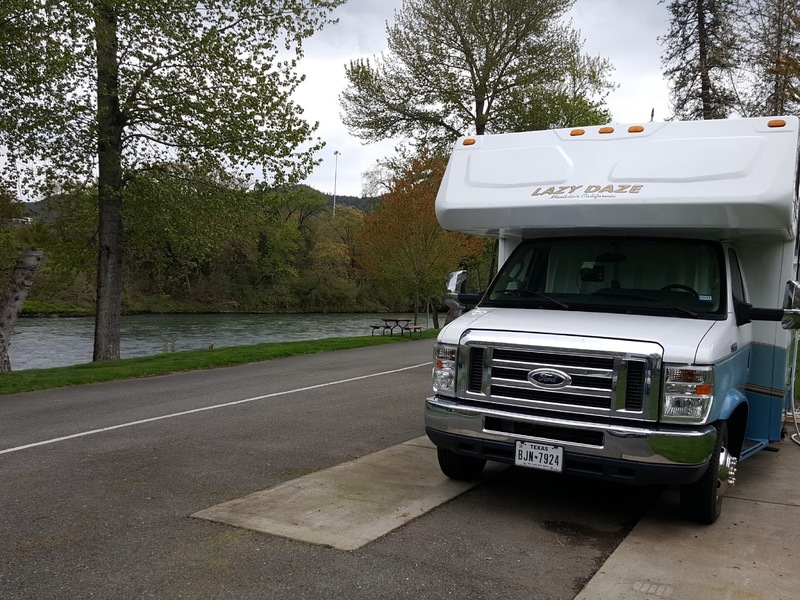 The owners and campers we meet are quite friendly and helpful. If it had been sunny, we would have been staying 2 miles down the road(Route 5) at Valley of the Rogue State Park. In a few weeks or so, there will be many kayakers and rafters on this river. 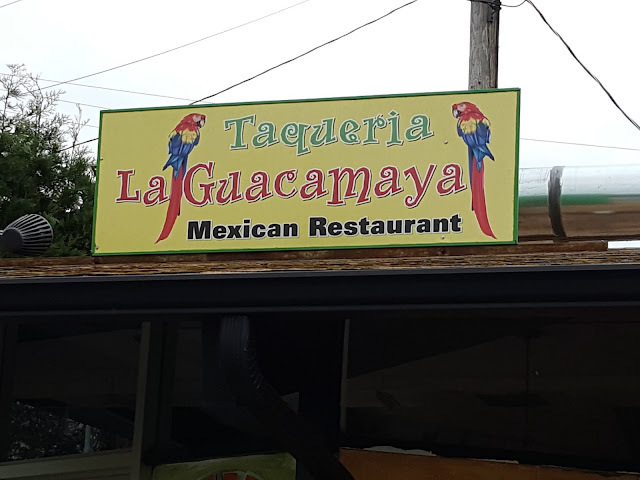 A plus for our stay was being a short walk from La Guacamaya Mexican Restaurant. We had stopped here two years ago in the middle of a bike ride from the state park. Wonderful food. This time Jan had Huarache with shredded pork and I had Chimichunga-chicken. This link will give you a little of the Yelp pictures and reviews. From Bridgeview we head back a few miles to Grants Pass and the Fred Meyer grocery store. These are always an eyeopener for us. It is like a huge megastore with furniture, food, and more. But the grocery section is something like a Market Basket to Whole Foods. Wow!! 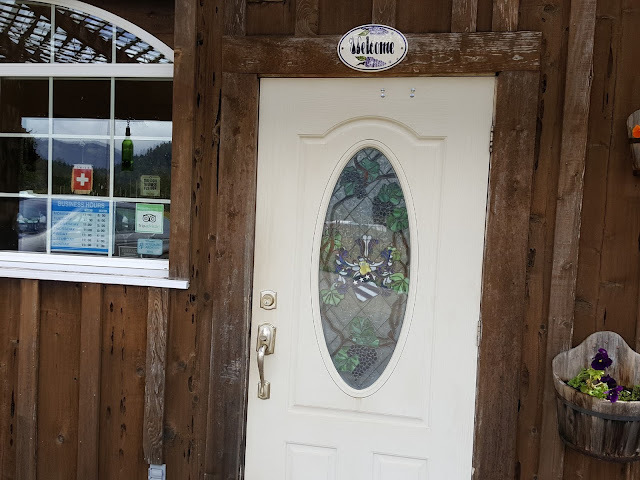 From there, we head north on Route 5 to exit 119, Route 42 west to Tenmile and the Girardet Wine Cellars, another Harvest Host. A pleasant, welcoming tasting room. 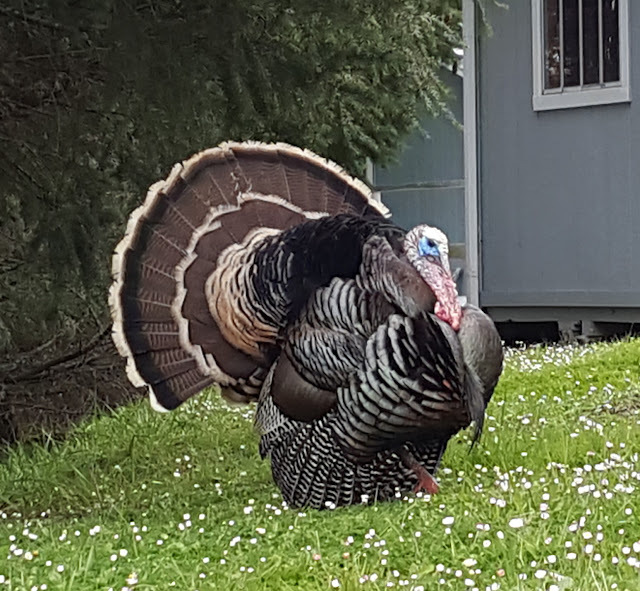 Lady Blue is happy to rest amongst the vines again. We are far enough north to notice that the vines are just beginning to bud. This is a small vineyard, but still has a good supply of chardonnay, zinfandel, merlot, temperanillo and more. Two new names for us were Seyval Blanc and Baco Noir (their flagship wine). We had a great talk with Yvette, our host for the tasting, and Marc , the owner. The following link should take you to the background story for Girardet. We found it quite interesting. And, of course, it rained again. But---this time we are treated to a wonderful double rainbow. A very short time, but, oh so bright! 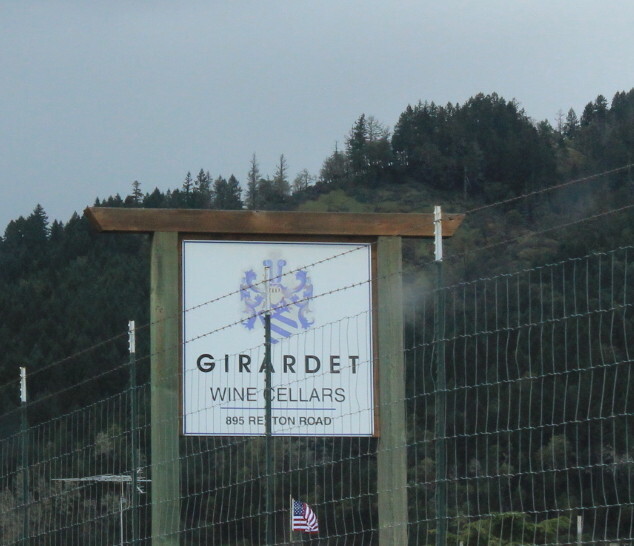 From Girardet, we head back to Route 5 north to Sutherlin to pick up our mail--it's been about a month. 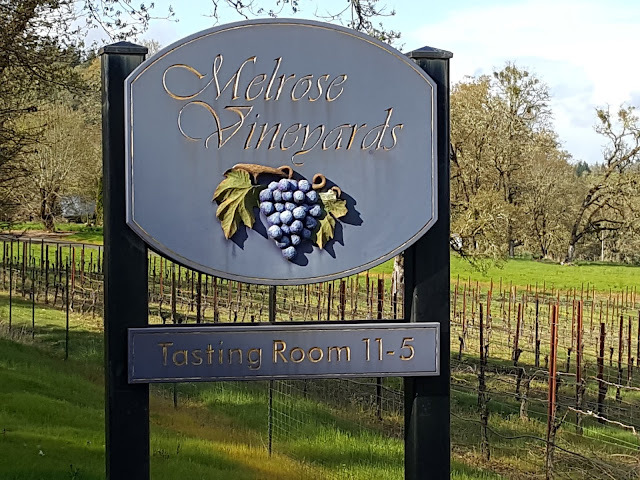 Then we head back south a few miles to exit 125 west to Melrose and Melrose Vineyards. 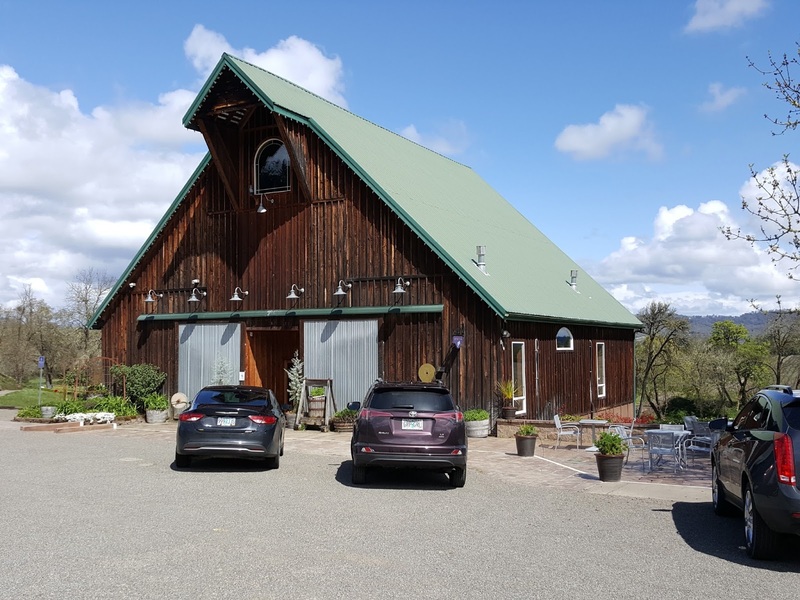 This is a larger production with a very nice barn style tasting room. Another Harvest Host, they were quite happy to have us as Harvest Host members. Other Hosts have been welcoming as well, but this time we spent a good bit of time discussing RV travel with two of the Melrose staff. Interesting also, that we had given a copy of our Escapee RV magazine to Yvette, our Girardet host who is interested in doing the RV life. Lady Blue is quite comfortable in her parking spot. Melrose does a lot of Event Planning--weddings, etc. 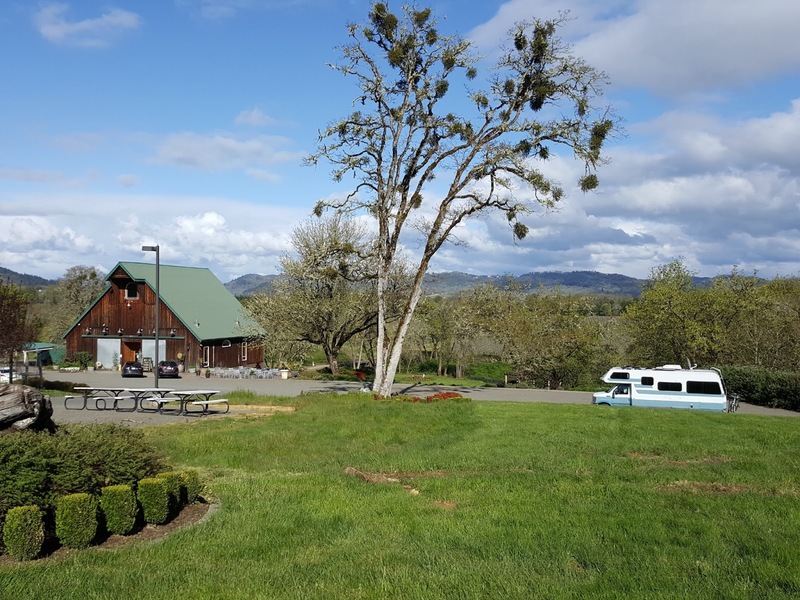 Lots of space to park and for catering or cooking on site, plus entertainment. 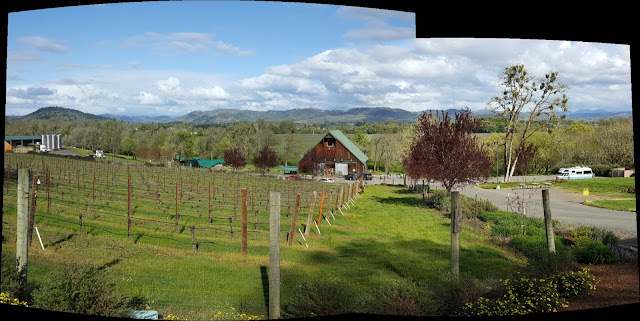 Not only a beautiful tasting room, but long distance views once the clouds lifted. Melrose had a long list for tasting of about 14 different whites and reds. New for us here was the Viognier white. The Riesling was also quite enjoyable and the Pinot Noirs. 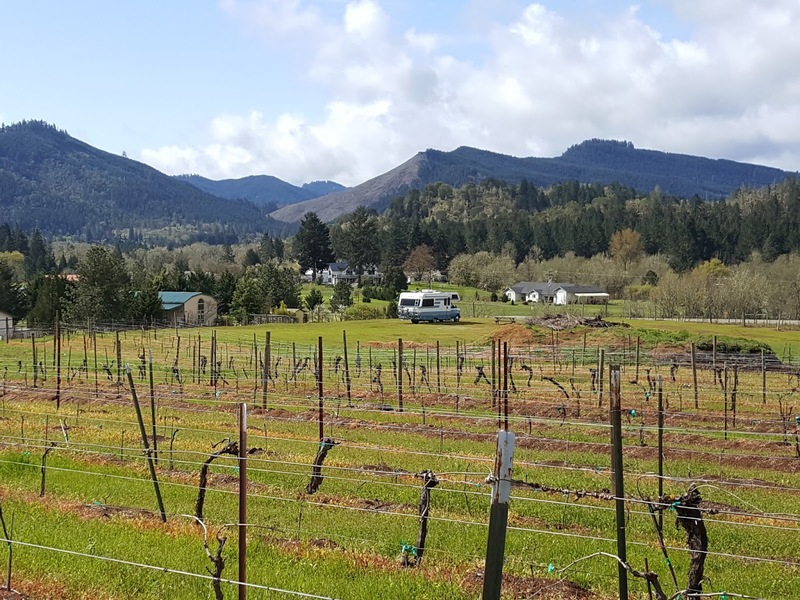 These vineyards are part of the Umpqua Valley Wine Area. A little more of the view with the distant mountains and the storage and bottling facility to the left. 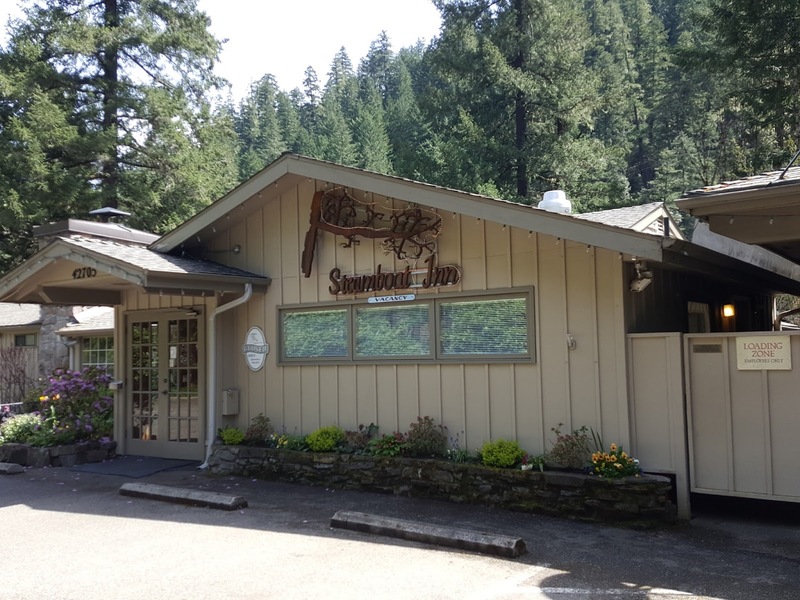 From Melrose, we head into Roseburg and onto the Umpqua Scenic Highway , Route 138 east to Steamboat Inn. This location used to be the North Umpqua Lodge, where names like Ernest Hemingway and Zane Grey would gather for Fly Fishing and relaxing. The above link will give you some good history of the area. Just click on each section like "introduction"
The Cafe was open for brunch. Jan and I ate in the dining room--a little to the left of this. 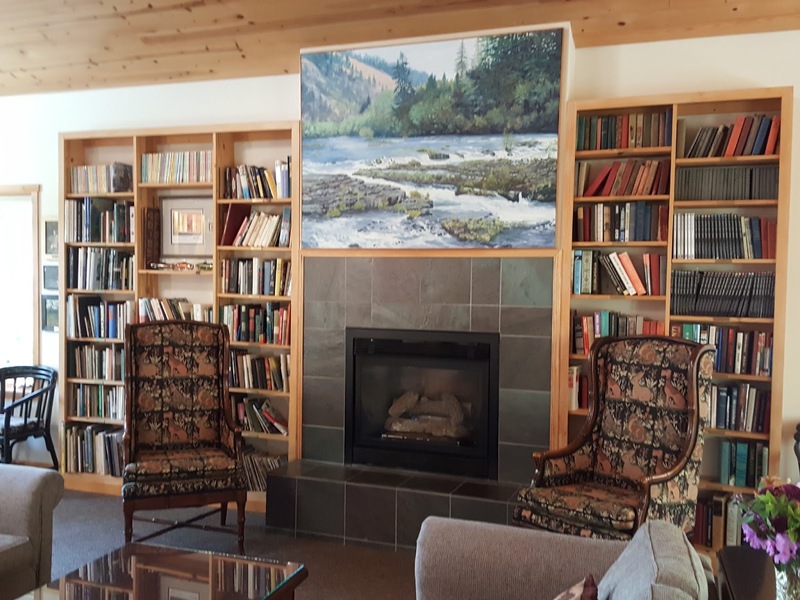 This is the Library where , in the busy weekends, guests can gather for drinks and appetizers before dinner. The view is right down to the river. Jan had a Strawberry/Rhubarb rollup with sour cream and I had Orange French Toast with cheese filling. 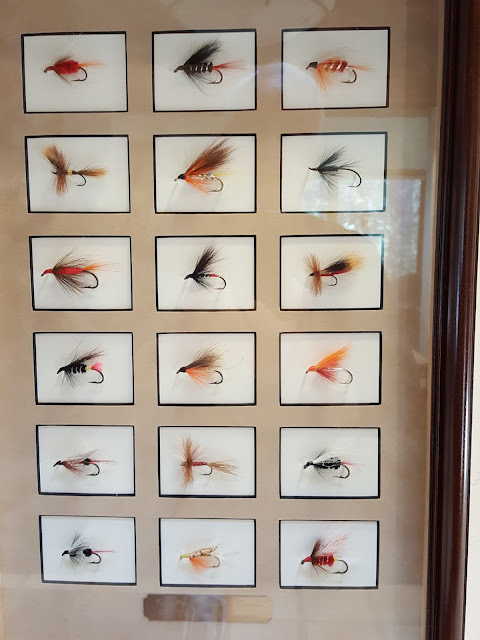 Nice hand made fly fishing lures. 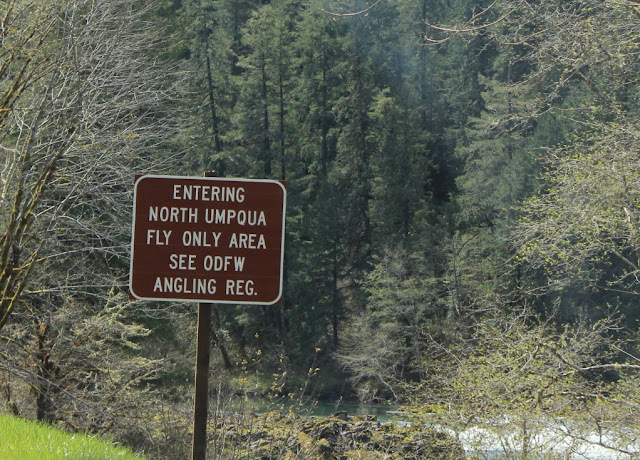 A premier area for fly fishing. Note that miles of this river are limited to fly fishing only. We saw many fly fishermen on our trip to Steamboat. There were at least two here(note the one on the river curve on the left). The river is running quite well with the rain and the snow melt just beginning. The river is noted for Steelhead Trout. 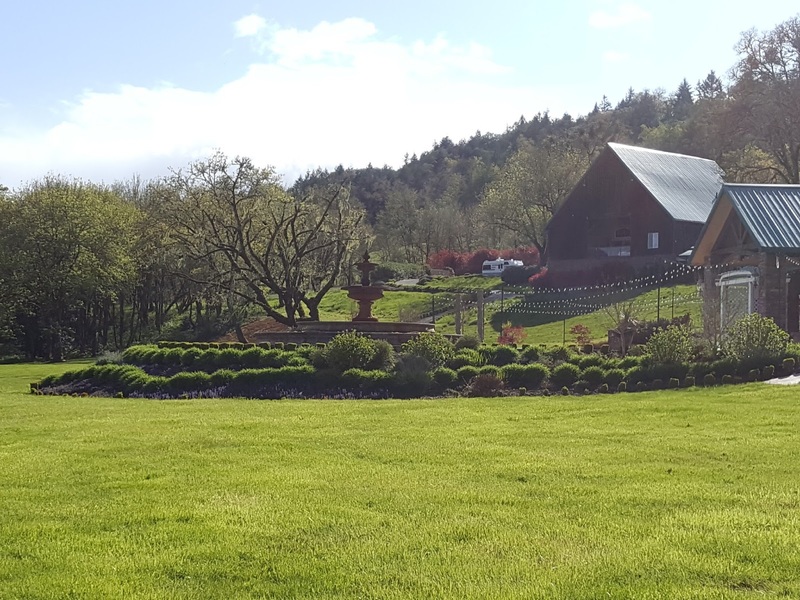 We head back to Sutherlin and our membership Escapee park Timber Valley. Nice, large sites and entertainment from the local wild turkeys--with a few jackrabbits as well.